Omnii XT 15f - Perfect for cold chain operations! Cold chain work demands a special breed of handheld device, tough enough to withstand subzero temperatures, ice buildup and freezing condensation. The XT15f thrives in this unforgiving environment, with ice-resistant keyboards, heated displays and scan window defoggers.It enables your workers to achieve flawless fulfillment in the coldest corners of your supply chain — from the loading dock to a freezer in an ice cream manufacturing plant to an outdoor yard in the arctic cold of a wintery day. Psion's Omnii XT15F comes in two models. The XT15f Chiller is built for -20°C / -4°F environments, while the XT15f Arctic is designed for -30°C / -22°F environments.So even in amazingly cold conditions, your workers can access the real-time information they need to streamline inventory management. The large high-resolution color touchscreen makes it easy for workers to interact with applications. Key size and placement make data entry easy with one hand, gloved or ungloved. 802.11a/b/g/n Wi-Fi provides compatibility with virtually any wireless LAN; support for ‘n’ provides plenty of bandwidth to support any application. With a dual IP65 and IP67 sealing, workers can spill water on or even drop the device in a puddle of water — or work out in the pouring rain. And even a 6.5 ft./2 m drop to concrete won’t impact operation. 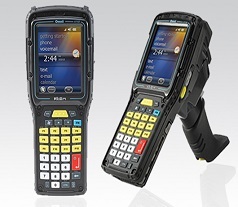 Three best-in-class scanning options allow you to capture the bar codes you use today and in the future — 1D or 1D/2D.